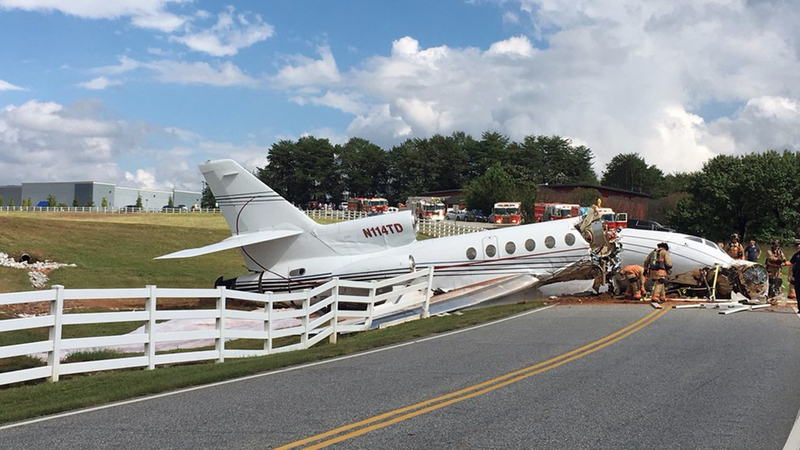 On September 27, 2018, about 1346 eastern daylight time, a Dassault Falcon 50 business jet, N114TD, operated by Air American Flight Services, Inc., was substantially damaged when it overran the departure end of runway 19 at Greenville Downtown Airport (GMU), Greenville, South Carolina. The airline transport pilot (ATP) seated in the left cockpit seat and private pilot seated in the right cockpit seat were fatally injured, and the two passengers received serious injuries. Visual meteorological conditions prevailed, and an instrument flight rules flight plan was filed for the flight that departed St. Pete-Clearwater International Airport (PIE), St. Petersburg-Clearwater, Florida, destined for GMU. The personal flight was conducted under the provisions of Title 14 Code of Federal Regulations Part 91. 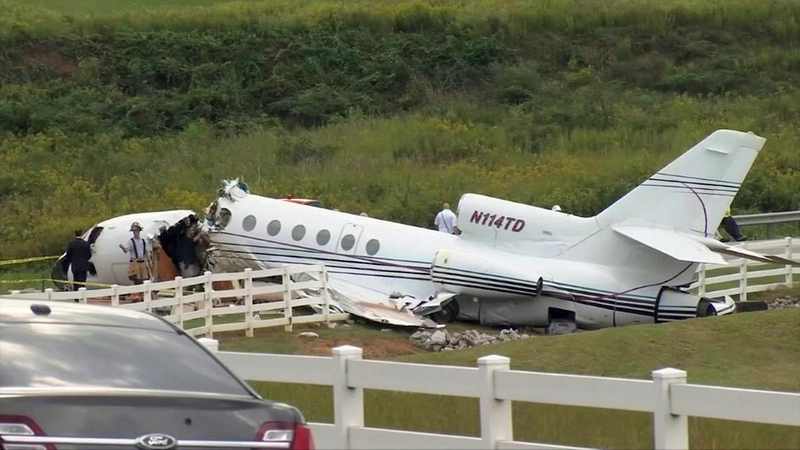 Air traffic control personnel at GMU reported that the airplane touched down "normally" at a normal touchdown point on runway. They saw the airplane's sole thrust reverser on the center (No. 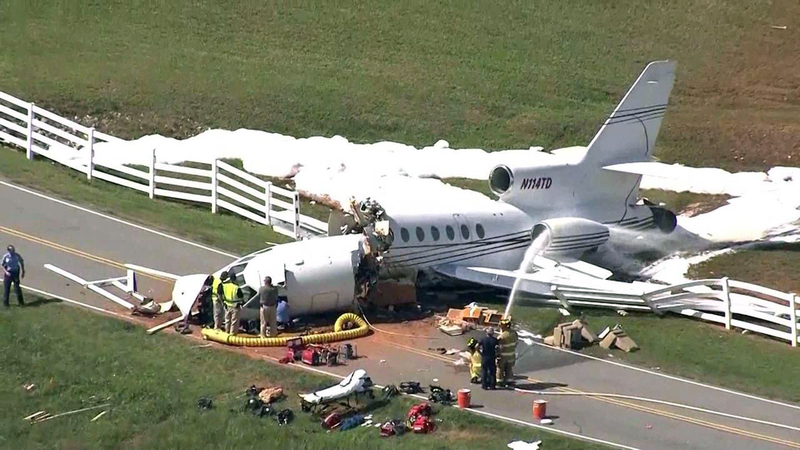 2) engine deploy; the controllers then watched as the airplane "did not decelerate" as it continued down the runway. An airport security video captured the airplane's touchdown and confirmed that the No. 2 thrust reverser and the airbrakes were deployed. 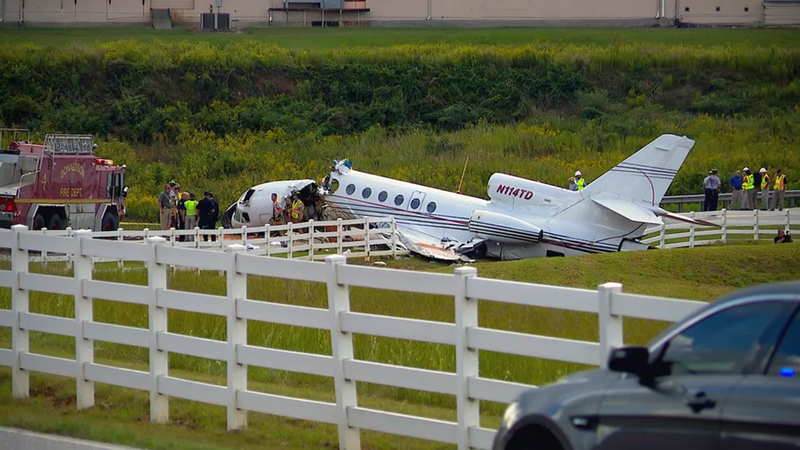 The video also showed the airplane as it continued down to the end of the runway and then went over an embankment. 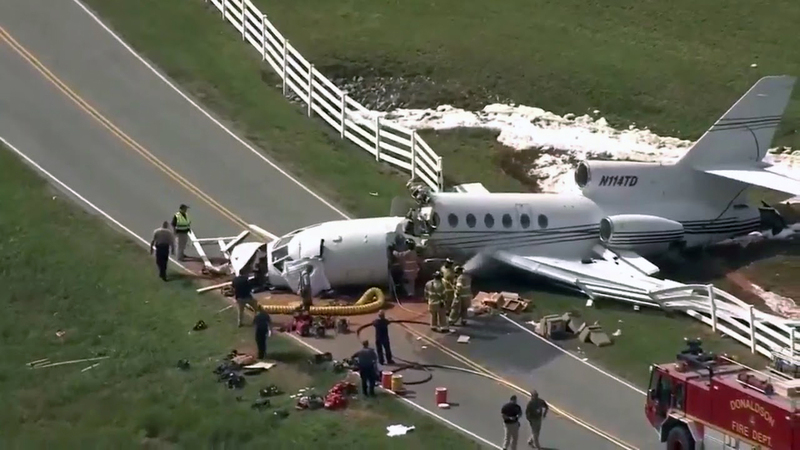 First responders reported that all three engines were operating at full power for at least 20 minutes after the accident with, one engine running until about 40 minutes after the accident. 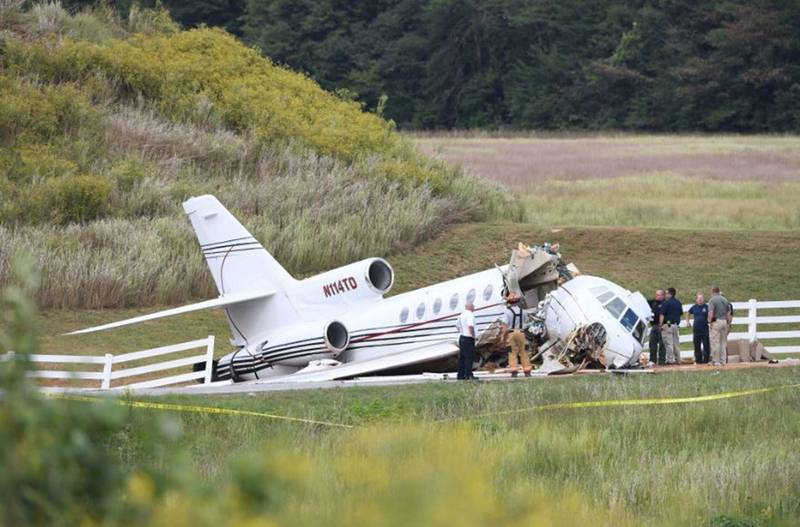 Initial examination of the accident site, runway, and tire track evidence showed that the airplane departed the left edge of runway 19 near the departure end, traveled across the flat grassy area at the end of the runway, continued down a 50-foot embankment, and came to rest on the airport perimeter road about 425 feet from the runway. The wreckage was oriented on a heading of about 160°. There was no fire. 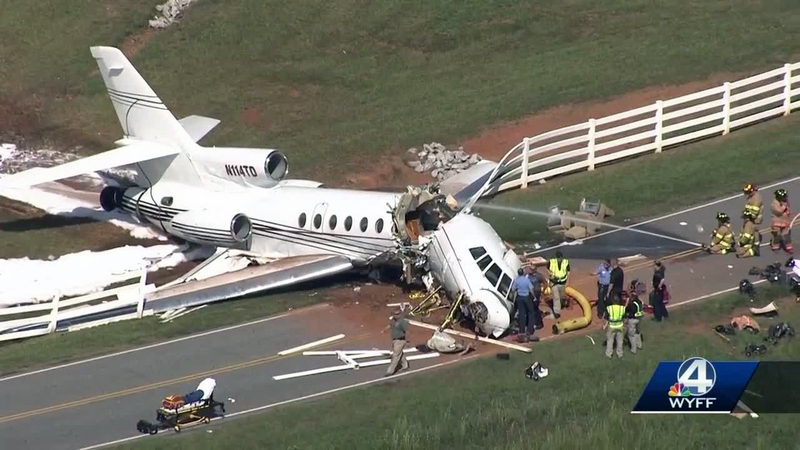 Fuel was observed leaking from the wings at the accident site. The nose landing gear was separated and found about midway down the embankment. The fuselage was separated immediately aft of the cockpit area, near fuselage station 14. The slats and flaps were extended. Both the right and left airbrakes (spoilers) were extended. Both main landing gear were fractured at the trunnion and displaced aft into the flaps. The braking anti-skid switch was in the No. 1 position, and there was an "INOP" (inoperative) placard next to the switch, dated the day of the accident. The Nos. 2 and 3 fire handles were pulled. The parking brake was in the normal (off) position. The left seat pilot held an ATP certificate with a type rating for the Falcon 50 with a limitation for second-in-command only. He also held type ratings for Learjet and Westwind business jets. 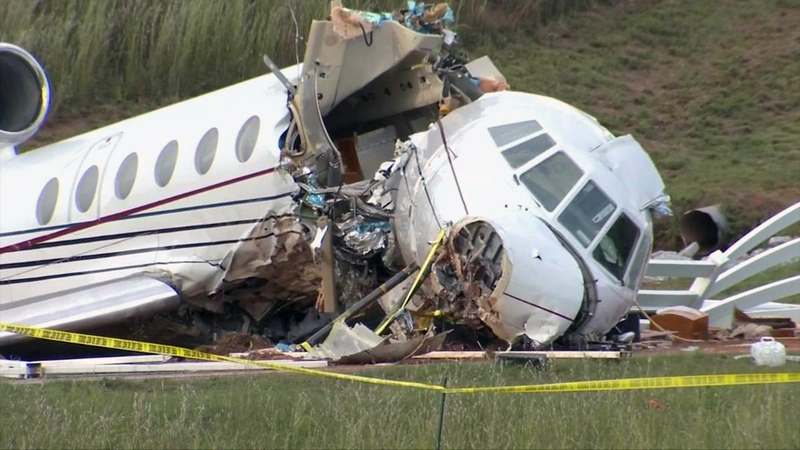 He held a Federal Aviation Administration (FAA) first-class medical certificate issued on August 7, 2108; at that time, he reported 11,650 total hours of flight experience. The right seat pilot held a private pilot certificate with ratings for airplane single and multiengine land. He did not hold an instrument rating. He held a FAA second-class medical certificate issued on March 27, 2017,and on that date, he reported 5,500 total hours of flight experience. At 1353, the recorded weather at GMU included wind from 210° at 6 knots, 10 statute miles visibility, temperature 27°C, dew point 22°C, and a barometric altimeter setting of 30.02 inches of mercury. The airplane was retained for further examination. A preliminary report is available here below.